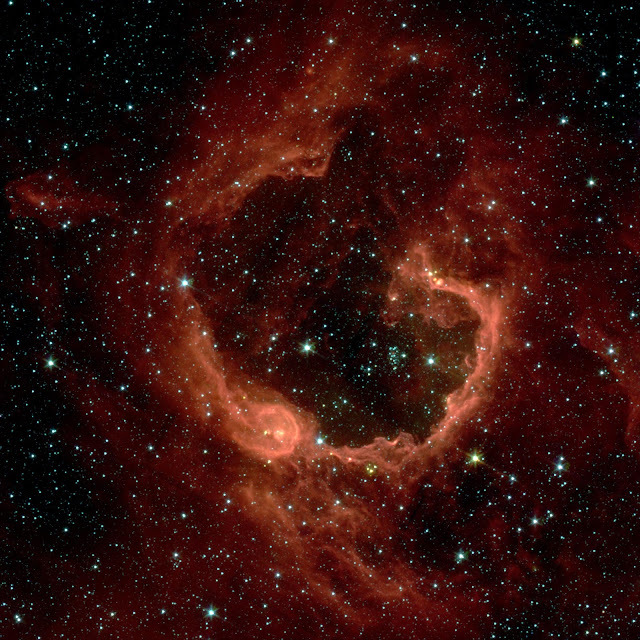 RCW 79 is seen in the southern Milky Way, 17,200 light-years from Earth in the constellation Centaurus. The bubble is 70-light years in diameter, and probably took about one million years to form from the radiation and winds of hot young stars. The balloon of gas and dust is an example of stimulated star formation. Such stars are born when the hot bubble expands into the interstellar gas and dust around it. RCW 79 has spawned at least two groups of new stars along the edge of the large bubble. Some are visible inside the small bubble in the lower left corner. Another group of baby stars appears near the opening at the top.